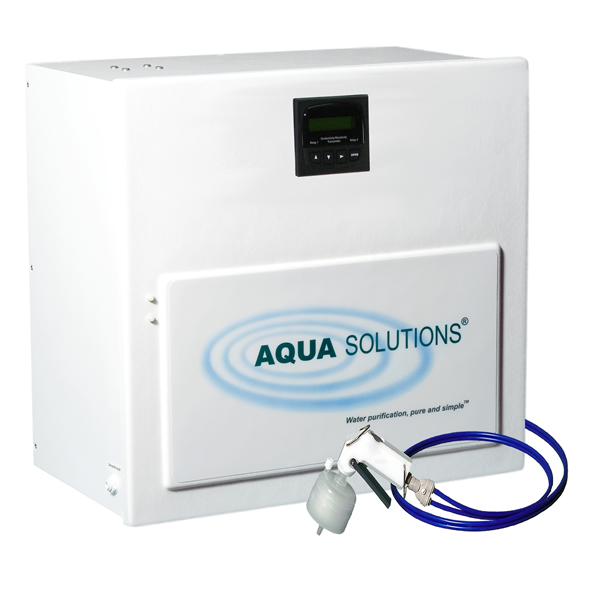 The AQUA SOLUTIONS' Model 2122BU is also available in a High Flow/Capacity (4-10 Liters/Min) version. These lab water purification systems are semi-custom designed for each application. Contact your salesperson for more information. This unit operates on ordinary tapwater. For pre-treated water operations, see Model: 2121B or Model: 2121BU. Versions are also available with built-in reverse osmosis pretreatment in a single cabinet design measuring just 20" wide x 20" high x 12" deep (Model RODI-C-12B and Model RODI-C-11BU). Designed for applications that require up to 20 Liters/day of Biological Grade Type I Ultra Pure water, this laboratory water purification system produces 2-Liters/minute of 18.2 megohm-cm Type I water from ordinary tap water containing less than 250 PPM of total dissolved solids. The unit includes a built-in ultrafilter to reduce pyrogen, endotoxin, DNase and RNase to the lowest possible levels. The system is also equipped with a built-in ultraviolet (UV) sterilizer to control the growth of microorganisms within the system. All AQUA SOLUTIONS Biological Grade Type I DI Laboratory Water Purification Systems produce purified water that meets or exceeds ASTM, CAP and CLSI specifications for Type I reagent grade water. Since ordinary tap water contains 5-25 times the impurities of pretreated water, these tap water systems have lower overall capacity than pretreated water systems. 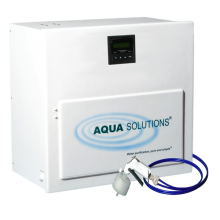 Feed Water Quality For operation on ordinary tap water that contains less than 250 PPM of TDS (total dissolved solids).